The last two Premier League games have brought mixed emotions, particularly for Seamus Coleman, who was outstanding against Newcastle United last Monday night, only to suffer at the hands of the impressive Manchester City attack on the Saturday. Seamus Coleman has certainly made the right back position his own over the last 12 months and in the match against Newcastle it was easy to see why. Solid in defence, Coleman produced an assured display that left Newcastle’s most potent attacking player, Hatem Ben Arfa so impotent, that Alan Pardew was left with no other alternative than to substitute his star winger at half time. But it wasn’t just defensively that Coleman impressed, he was at his very best in attack, pushing forward to support Everton’s offensive players, linking up with Kevin Mirallas, Ross Barkley and Romelu Lukaku to devastating effect. This first graphic perfectly demonstrates Seamus Coleman’s ability going forward, particularly his willingness to take on his man and push towards the penalty area. Against Newcastle no player on the pitch beat his opponent as often as Coleman, with the Irishman completing 5 out of 5 dribbles. 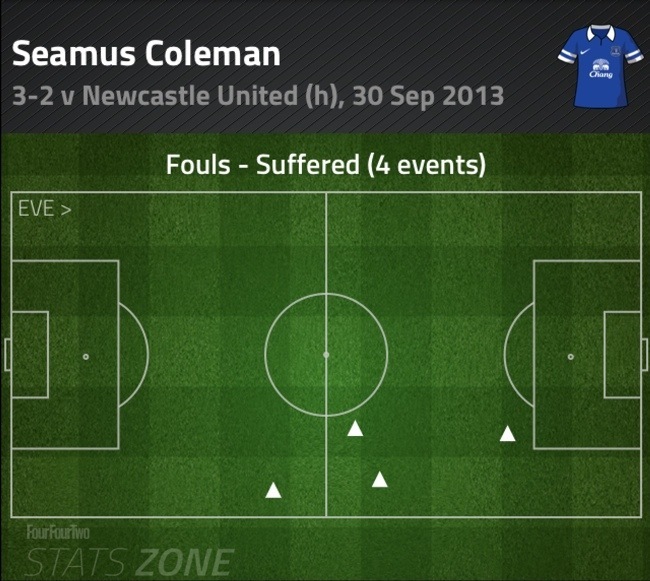 Coleman’s positive running does place his opponents under tremendous pressure forcing defenders into fouls. In the Newcaslte match he was in such impressive form, this was the only way they Geordie defence were able to stop him, with Coleman fouled on four occasions, again this was a match high. 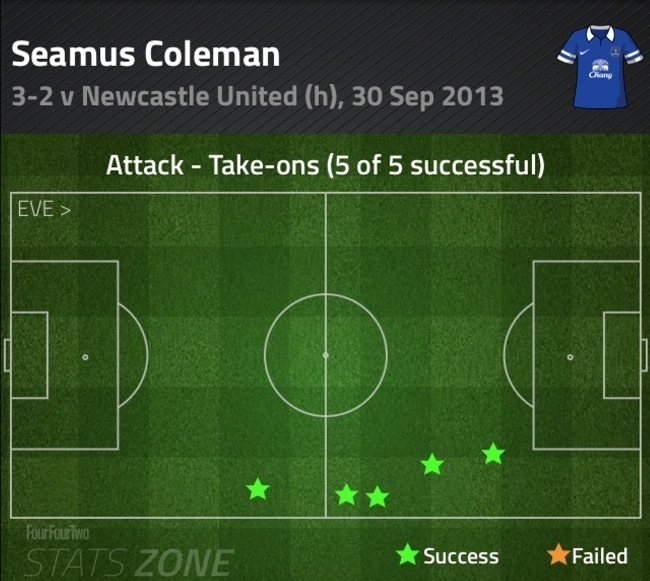 The final graphic shows how Coleman has developed the defensive side of his game. Coleman was many observers man of the match and it is easy to see why. On 8 occasions he was able to intercept the play, all in dangerous areas of the pitch and ensuring that the Newcastle threat from Ben Arfa was nullified with total success. However fast forward to Saturday and two moments of naivety cost Everton and Coleman dear, as Manchester City used their professionalism to unsettle Everton and take full advantage to score the decisive second and third goals. With the game delicately poised at 1-1 and with both sides possessing plenty of attacking intent, Everton were undone shortly before the half time interval, as a melee off the ball led the back four to crucially lose concentration. City took full advantage with Sergio Aguero pouncing to give the home team the lead. The goal could easily have been avoided, but Everton were caught defending far too deep after Seamus Coleman became involved in a scuffle with Alvaro Negredo. The Spanish striker clearly exaggerated a fall, which angered Coleman. Unfortunately for Everton, the Irishman chose to take the former Sevilla man’s bait and squared up to the bristling centre forward. As the squabble continued off the ball, City recovered possession and launched a lightning quick counter attack. With several in Royal Blue out of position, Aguero was left one on one with Distin and he fired powerfully and accurately past Tim Howard in the Everton goal. If Coleman was indirectly at fault for City’s second, he was certainly at the centre of the third Manchester City goal. With Everton struggling to gain a foothold in the second half, City pushed forward and were awarded a dubious penalty after Pablo Zabaleta theatrically fell in the box under pressure from Seamus Coleman. The numerous replays suggested that the contact was at best minimal, but the Argentine full back took full advantage of Coleman’s naïve touch and fell so convincingly that the poor referee awarded a spot kick. It could be argued that Coleman did little wrong and this was the public view taken by Roberto Martinez, however in private, the Everton manager will be urging Coleman not to give the referee opportunity to award a penalty kick in the future. Despite these blips, Coleman has enjoyed another outstanding start to the season for Everton and will look to put these blemishes behind him as he continues to make huge improvements game by game. 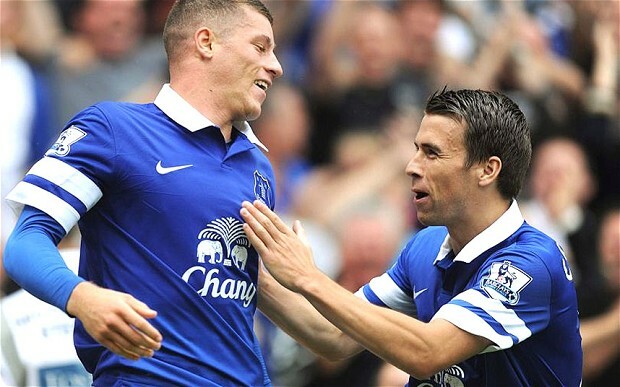 The positives in his play are numerous and he offers Everton tremendous balance on the right hand side. Previous Post Is Leighton Baines less effective without Steven Pienaar? Next Post Is now the time to sell Jelavic?